A big part of what I like about soukous music and other Afropop is the contrast and oscillation within it. Rhythmically, each bar of the highlife guitar pattern is a tiny tension and release, the first bar or half bar syncopated and the second half straight quarter or eighth notes. Harmonically it is typically a similar oscillation between two chords, an ad nauseum simpicity back and forth that contributes to the genre’s dance and trance sound. On a macro level, the best songs are structured with more tension and release within their parts, and as they are generally around ten minutes (four songs would fit on an LP or two halves of a song on a 45), there is plenty of room to build musical tension. Repetition is key. The solos aren’t really solos generally, but “sebenes,” a term with a nebulous origin that I won’t speculate on. A sebene is an instrumental feature wherein a single player improvises around a theme without straying too far until a new theme comes along. This approach to instrumental sections really appeals to my musical tastes, as I couldn’t care less about the technical ability that solo sections generally showcase. The sebene is more about melody than chops, and the Congo artists were, and are, much more patient than American songwriters typically are. In early 2014 I found this post on Brian Shimkovitz’s Awesome Tapes From Africa blog. Jeff Bryant from my old band Pollens had turned me onto this blog (and a lot of African music in general). In 2014 Awesome Tapes was still a music sharing download blog. Today it’s actually become a label and distribution outfit for African music in the United States. Shimkovitz tours doing DJ sets of amazing African music, and if you get the chance go see him. It’s unique. Anyway, I had pulled a fair amount of albums off Awesome Tapes by this time, but this mixtape just grew on me endlessly until I was obsessed with it. Soon I started looking for more music by Kiam/Orchestre Kiam, and trying to learn everything I could about them, falling further and further down the rabbit hole of trying to find English search results for Congolese French/Lingala music, but Kiam became the most profound musical influence in my life since I played in Pollens. Never did I expect that my favorite band would be singing in a language I couldn’t understand (and also broken up before I was born). Kiam played rumba rock, cavacha, soukous music in the early to late 70’s in Kinshasa. They were one of the Verckys stable of bands, and were relatively obscure within the scene. They had a few hits but never achieved star status, and never had a big vocal name fronting them. However, they nailed all the elements like no one else I’ve heard. The vocalists were all very strong, the rhythm section was super solid and bouncy and driving and exciting, the songwriting was top notch, and most strikingly they had the best guitarists in the whole scene to my ear. Technically, the only hard soukous player on a higher plane from this era is probably Orchestre Stukas’s lead player Samunga Tediangaye,. The real magic however was not in Kiam’s technical prowess but their melodic ability. Both their vocal choruses and calls and their sebene lines are absolute platonic forms of catchiness. The lead guitar plays perfect melodies with a soaring treble and plenty of reverb. When the rhythm guitarist takes over, his tone mid-rangey and scraping in comparison, the lines are fascinatingly weird. I swear he was tapping years before Eddie Van Halen thought of it, a lot of self-taught African musicians came up with unique ways to play their instruments. Unlike countless musicians and bands that came out of the rumba and soukous scene, Kiam never achieved the kind of recognition that would even warrant a Wikipedia page. However there is a strong cult following online, and broad consensus from those who heard them is that they are one of the best hard soukous bands of all time. They’re often put on a level with Zaiko Langa-Langa, who played in the same era without horns and also featured great guitar and vocal work in driving soukous. But to me Kiam was comparatively very consistent. Langa-Langa has decades of material and I’d name about 15 songs of theirs that I really like. Of Kiam’s 35 or so songs (most of which are around ten minutes in length as was common in this era), almost all are fantastic. Thinking back on the music that resonated with me over my whole life, I came to realize that I had found a band that had everything I’d ever wanted. It was one of those moments when you love a piece of art so much that you get a little angry because you didn’t create it. It just seemed to fit my tastes perfectly. To give an idea of the difficulty of finding good information about an obscure soukous band from the mid-70’s, here is the best site I found with the most information in one place about Kiam. Yes, that’s a Geocities site, in Japanese and French. I’m shocked it still exists. In mid-March 2014 sent the Awesome Tapes mixtape post to my brother Ryan in a text message. Ryan was a huge fan of many African genres and I knew he’d enjoy it. He texted back, “Great sunny soukous dance music.” At the time I had barely heard the word “soukous,” and didn’t know to ascribe it to Kiam. So Ryan’s remark gave me something to google, which of course I did. It was a watershed moment. A week or so after our exchange, Ryan killed himself. He’d been struggling with severe anxiety and mental illness for a decade or more. His text about the band was the last communication I had from him. I went on a planned musical retreat soon after that, and channeled everything about his death into a set of Garageband demos that became the first Northern Thorns songs. Though I’d love Kiam no matter what, this music will forever be linked in my mind with Ryan and his suicide. I can’t listen to it without thinking about him. It’s criminal to me that Verckys Kiamuangana Mateta barely has a Wikipedia page, it’s like a consolation prize considering his influence on Afropop. My favorite group of the whole era, Kiam/Orchestre Kiam, was one of his stable bands and took its name directly from his. Verckys was a musician, manager, promoter, club owner and financier of a lot of the very best bands in the Congo music scene, and was right on the cutting edge of bringing in rock influences to the music. The bands Verckys was involved in are some of my favorites. Rather than going on at length about him here, I’ll link to a Likembe post that was significant for me when I was discovering this stuff. It has a free downloadable mix, grab it! It’s great. I still burn CDs. Sometimes. The songs are long, so eight tracks basically filled a CD. There was no theme to this one, I just put a bunch of songs that really stuck out to me on it. If anyone would like a copy of this mixtape, contact me. Page 13 of Rumba On the River. 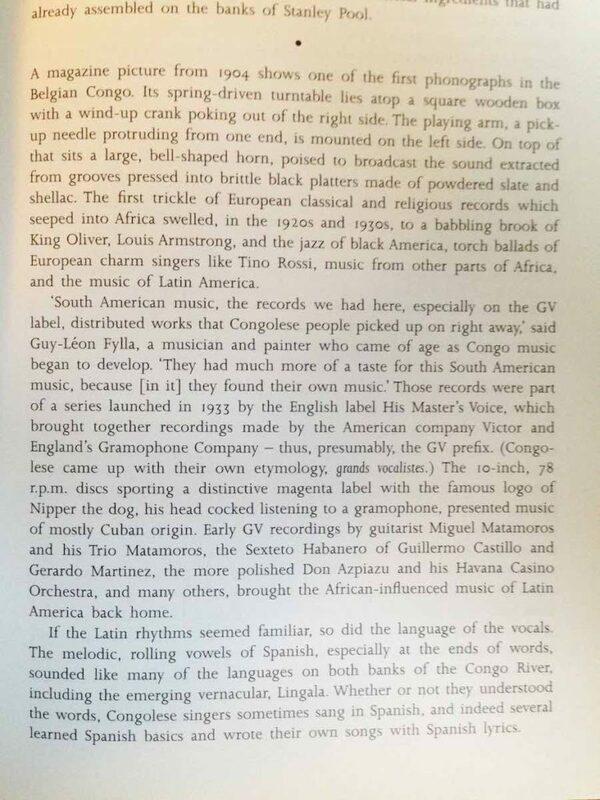 I like the way Stewart describes the arrival of Latin music to Congo. Much of it was black music from the New World, shaped through the lives of generations of slaves, coming home to Africa through the phonograph and being eagerly greeted by the neighborhoods of Kinshasa. This music I’m obsessed with, cavacha or soukous music, is from Zaire, now the Democratic Rebublic of the Congo, and its lineage like any other music can be traced as far into the past as you’re willing to dig. But the stuff I’m obsessed with is from the mid- to late-1970’s basically; I consider that time period the golden age of hard soukous music (by the way, most of the history I know surrounding this I gleaned from Gary Stewart’s excellent book Rumba On the River, the Congo music bible for uninitiated English speakers. Stewart describes early in his book the phonograph becoming available to the Congolese and all the music of Cuba and South America migrating back across the Atlantic after centuries of a sort of exiled development in the west. Access to recorded music, and migrants from outside the cities, made the scene in Kinshasa and Brazzaville possible. 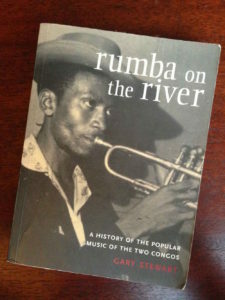 So, rumba happened, and got hugely popular, all over Africa. Often the genre was referred to as “Congo” music. It eventually grew to utilize large bands with multiple percussionists and electric guitarists, big horn sections and 3-5+ vocalists (the stars of the scene generally). The primary percussion instruments were maracas, bells and conga drums. Some big names such as African Jazz and OK Jazz reflect the Congolese affinity for the American term Jazz, even if their sound bore little resemblence to it. This Congo rumba music is often beautifully melodic, and there’s an absolute ton of it out there to discover. The scene thrived for decades. Sometime in the early 1970’s (near as I can tell), the American drum set was introduced to Kinshasa, and almost overnight everything got driving, louder, and irresistibly danceable. Bands discovered Jimi Hendrix and James Brown (whose visit to Africa in 1974 is constantly cited as a watershed moment for African music), and everything took on a rock and roll quality, even using the backbeat at times. This is the era I’m in love with. The marriage of the qualities of Congolese rumba with western rock music produced the best sounds I’ve ever heard. And though some people know the term “soukous,” I think the music of this era deserves to be heard more. So that’s my mission, on this site and through my own band.